The Rating Agency Fitch Ratings has assigned FLLC Mikro Leasing, part of Mikro Kapital Group, a Long-Term Issuer Default Rating (IDR) ‘B-‘ and a Short-Term IDR ‘B’. The Outlook is Stable. The ratings reflect Mikro Leasing’s narrow franchise, monoline business model in a niche segment, elevated risk appetite, sizeable exposure to direct and indirect foreign exchange (FX) risks, and a concentrated funding profile. The ratings also factor in the company’s acceptable financial metrics. 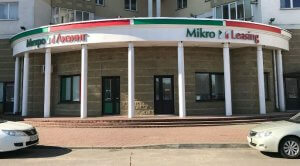 Mikro Leasing, professionally promotes the economic development of small and medium businesses of the Republic of Belarus by providing quality leasing services without additional collateral obligations. Founded in 2009 by Vincenzo Trani, President of Mikro Kapital Group, today Mikro Leasing operates 7 offices in the largest cities of Belarus: Gomel, Minsk, Brest, Grodno, Vitebsk, Mogilev, and Novopolotsk. Our team consists of experienced specialists who, during the last years of work, issued 7,187 leasing items and signed 5,411 leasing agreements. The total value of leased items is $ 87 million.